Al Ansab STP in Oman ... Phase 2 complete. 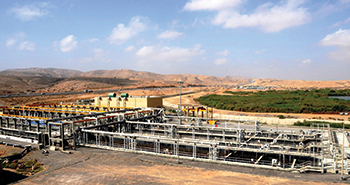 Oman Wastewater Services Company (Haya Water) has announced the successful completion of Phase Two of Al Ansab sewage treatment plant (STP) expansion project which has taken its capacity to 125,000 cu m per day. The project is now moving to the last and the third phase which is expected to be finished in 2022, said the Omani company. The expansion of the STP comes as part of the government’s efforts to keep up with the increasing demands of waste water treatment, a result of the rapid urbanisation in Muscat, it stated. A government-owned water reuse organisation, Haya Water said the Al Ansab Plant, which began operations in 2010 had a 57,300-cu-m-per-day capacity. With the completion of Phase Three of the project by the end of 2022, the plant will boast a 140,000-cu-m-per-day capacity. Al Lawati pointed out that the station’s capacity was sufficient to absorb the waste water that comes through the connected networks to the STP or through the yellow tankers which no longer have to wait to offload the waste water. Haya Water projects in Bausher, which extend from Al Hamryah roundabout in Muttrah to The Wave Muscat – through Hilat Al Sadd, Al Wattayah, Al Qurum, Madinat Al Ilam, Madinat Al Sultan Qaboos, Al Sarouj, Al Khuwair, Al Ghoubrah, Al Athaibah, Bausher, Gala and Al Ansab – are considered the biggest projects which have been executed by the company. According to the Omani group, the total length of the sewage networks developed under the completed and ongoing projects is about 660 km. The project has connected around 11,565 units to the sewage networks. In addition, the treated water distribution network length is about 87 km, it stated. On its future projects, Haya Water said the total length of wastewater network is about 232 km connecting 12,203 residential units and government and commercial properties. The treated water network will also expand to 23 km in 2028, it added.